Free download Fast and Furious 6: The Game for Android with APK file. It is based on the action movie with same name which was released in 2013, it is a racing game. It is free app for Android. The movie lover will also love this game; the gameplay is little bit different form the last one, but still has the ability to busy the players and attract them. It is developed by Kabam. 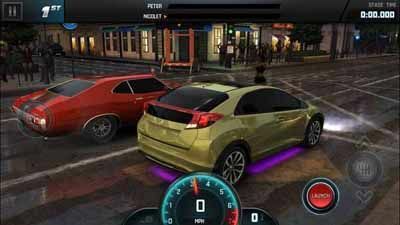 In Fast and Furious 6: The game, you’ll have new and amazing driving experience. You don’t need to control the car with steer like all traditional games have. It is just like Drag Racing in sense of driving and control the car. It needs a lot of attention of yours; you have to do the entire thing at right moments like hit the enemies, the perfection of changing the gears and all that. Each and every challenge of Fast and Furious 6: The Game is more difficult than the last one and you have to travel from point A to point B as early as possible. When you’ll play the story mode then your enemies will be the real movie characters and when you are in drift or drag challenges mode then your rivals will be other than characters. They are random rivals, but still they are able to defeat you and have a lot of skills. Show your skills and win the race. Fast and Furious 6: The Game is not boring like other racing games, unlike, it is very interesting game and enjoyable game when you are out of fuel then it increases your fuel levels and give the opportunity to compete again which is very interesting point of this game. There are a lot of collections of cars from old cars to latest cars. Each car which is selected by you can be upgraded, but for this purpose you have to win the currency or you can purchase it too.